Did some of our “Genius” rub off? $500,000 with absolutely no-strings-attached. The dreamiest fellowship of them all. It’s that time of year and the MacArthur Foundation has announced its list of fellows. We noticed among the list of “geniuses” a few past Studio 360 guests. 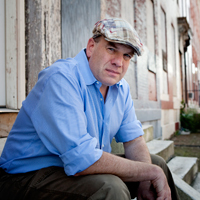 Last spring Kurt Andersen spoke to David Simon, the creator of The Wire and Treme on HBO and last summer we were treated to a live in-studio performance from the jazz pianist and composer Jason Moran. Way back in 2001, Kurt had a conversation with installation artist Jorge Pardo. The MacArthur Foundation chose 23 recipients across art, science, and the humanities: from a high school physics teacher to a fiction writer. Hear what all these MacArthur fellows had to say about receiving their grants here. And check out their Studio 360 segments below. The music industry is dying, and the smart money says the key to success is giving music away for free. Scott Blaszak has a better idea: he’ll pay you $10 to download his album. “Free is not enough!” Blaszak says. He has a name for his revolutionary business model: “PremiFree.” You saw it here first. Ronald D. Moore has one of the coolest jobs in Hollywood — he gets to play god in science fiction worlds that he creates. Before “re-imagine” and “reboot” were buzzwords, Moore re-invented the cheesy 1980s TV show “Battlestar Galactica” as an allegory for the War on Terror. His new series on the Syfy Network is called “Caprica,” and it’s a prequel to “Battlestar.” For Studio 360’s series on works of art that have changed people’s lives, I talked with Moore about how “Star Trek” has been his creative muse since he was a kid: you can hear that story here. I’m a big fan of his work – and of his podcasts. After each episode of “Battlestar” aired, Moore would upload a post-mortem commentary he recorded while enjoying a good cigar. Analyzing a scene, he’d jump from creative introspection to referencing historic military battles and on-set anecdotes. I was thrilled to finally be able to respond back to that interesting voice. In one of the best parts of our conversation (which had to be left on the cutting room floor), Moore talks about the constraints of writing for “Star Trek” and the need to break away when he reimagined “Battlestar.” Two immediate changes: no captain’s chair and no big view screen. In 1966, when Britain’s The Troggs hit it big with their classic tune “Wild Thing,” the members of the Austin-based garage rock band The Strange Boys had yet to be born. Thanks to the lasting power of records and a strong Texas scene, the group is now poised to inherit garage rock’s musical legacy. Lead vocalist Ryan Sambol and drummer Matt Hammer were only in 8th grade in 2001 when they started as a punk duo. That year, music by bands like The Strokes and The Hives was being consumed in mass quantities, helping to usher garage rock back into the mainstream — soon the group incorporated the trademark fuzzy guitar sound into their music. In 2008, The Strange Boys released their first full-length album, just in time for Sambol’s 21st birthday. The band has since played alongside respected Texas rock n roll acts Daniel Johnston and Roky Erickson. I had the great fortune of watching the Boys kick off a month-long tour for their new album Be Brave at The Saturn Bar in New Orleans. These days, their sound is a gritty combination of roots music, 1960’s R & B, and dirty southern soul — a sharp contrast to the precious baby-faced innocence the group evokes on stage. Sambol’s early-Dylan drawl is instantly recognizable and their twangy-guitar and up-beat tempo in songs like “Woe is You & Me” and “I See” are reminiscent of The Velvet Underground. For Be Brave the band has added a saxophone to the mix, played by Jenna Thonhill-Dewitt, former member of the Californian punk band Mika Miko. Midway through the group’s languid title track, Thonhill-Dewitt broke out into a warbling saxophone solo and proved their music is developing in a surprising and unique direction. Even as Sambol’s Fender string snapped halfway through the show, the group played on, referencing everything from free-jazz, to soul to good old fashioned rock n roll. The Strange Boys are inching their way northward after a line of performances in the South. Check them out tonight in Ithaca, NY before they make their way to Montreal and continue on through the Midwest. Their full schedule is here. The next time you hit the club, you may find yourself rocking out to a song sung by a nine-year old. I’m amazed at the buzz swirling around Willow Smith‘s first single “Whip My Hair.” The song is sassy, confident, and already receiving comparisons to Rihanna. Of course, it’s no secret that Willow comes from an entertainment dynasty: she is the daughter of Will and Jada Pinkett-Smith and at the tender age of nine, she’s inked a record deal with Jay-Z’s Roc Nation. One thing that impresses me about Willow’s song is how mature she sounds. Her vocals are already a pretty convincing alto. And her chosen wardrobe is much more avant-garde than her famous parents or brother. When you take a break from bobbing your head and finally listen to the lyrics, you’ll realize they’re actually pretty age-appropriate. This young star-in-the-making has already created a successful pop product, with a style that’s all her own. But will she be a one hit wonder? She has many years ahead of her for that to be determined.